I suppose the battalion of Polish troops working with NATO in the early 1950s in France were in limbo. There were others at that time, casually termed "DPs," meaning "displaced persons." I wonder now what sort of papers the Poles carried, whether they had passports. As I recall some of the officers had wives and families with them. I remember my father saying that a few of the officers had held prestigious positions in pre-WW II Poland -- in the Army, in the Polish Military Academy, in the Polish government. The troopers were less discussed, I suppose mostly because of the language barrier. I remember traveling with my father to an ammunition dump, the main gate of which was being guarded by a single soldier with a dog. It was a Sunday afternoon, and our family was simply sightseeing. My father got out of the car, walked to the gate, was admitted, and then he walked around the dump for a while. All during his informal visit, the dog lunged at the end of its leash and the trooper simply stood in place, following my father's movements with his eyes, stoic, no change of expression, no sign that he either welcomed or resented my father's intrustion. When the inspection was complete, the trooper opened the gate for my father without saying a word, and the dog kept barking and lunging until my father returned to the car. "I think he was in the Underground too long," my father told my mother, "and the dog too." While it was no oddity that the battalion had a canine unit, given that one of its duties was base security, I remember it strange that the dogs were as an assorted a bunch as might be found in any city pound. When we hear "K-9," we expect to see German Shepherds or Dobermans, but that unit had only one or two of those breeds. The remainder, as I recall, ranged from St. Bernards to Great Danes to large mutt-appearing animals. I was fascinated by the Poles, perhaps because each time I was around them I felt welcomed, no doubt because so many of them were separated from their families. I never really knew how my father felt about his duty. He was the sort that accepted his assignments, kept his uniforms starched and iron, his brass shined, and reported in early every morning. How the Poles felt about him would be another story. 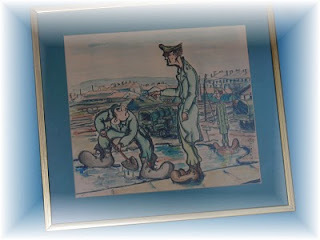 When his assignment was over, the battalion gave him the water-color seen here, painted by one of the enlisted men. My mother thought it captured him perfectly, but my father doubtless never read Robert Burns -- Oh wad some power the giftie gie us. To see oursel's as others see us! But the painting graced the walls of their home until their deaths, my mother even taking it to be cleaned and reframed once. I suppose it says something that my father never asked her to take it down.